I knew this project would not be without its hitches. Tonight’s game is Lost Eden by Cryo. It is already in MobyGames but needs screenshots. I decided it would be useful to focus on games that just need screenshots vs. totally new games since I have a mounting backlog of games to insert into MobyGames (also working on that this weekend). It did not go well. Trying to run the game under DOSBox 0.65 has bad results. It brings Windows XP to its knees in a way that makes it nearly impossible to even bring up the task manager in order to forcibly terminate the emulator. I decided to try my luck in an OS that has a better reputation for stability — Linux — and things went worse. DOSBox freaked out in much the same way but was also capturing all input events. I was left with no choice but to assassinate the X server with Ctrl-Alt-Backspace. So, no Lost Eden unless, perhaps, I pull an actual DOS-based box out of the storage closet. But I don’t see why not playing it should stop me from reviewing it. I was sort of looking forward to this one since the manual includes a foreword by an old-school D&D fanboy who actually states, “These days the quest is on for the ultimate Adventure Game – the Interactive Movie.” This game was released is 1995 and with retrospect, that passage is absolutely hilarious. According to the MobyGames entry, the game was also released for the CD-i and 3DO systems, 2 other systems known for this type of FMV fare. MobyGames’ description also claims that Lost Eden is comprised wholly of pre-rendered FMV. Sure enough, the MultimediaWiki lists this game as using Cryo’s HNM multimedia files. However, the manual makes it sound as if there are some other elements to the game, some kind of adventure/strategy angle. The story, in a nutshell, is that in this land called Eden, there’s an evil dude who commands T-rex dinosaurs to attack humans. You are a prince who lives in a fortress impervious to dinosaurs. Now that you have come of age, you are going to lead a quest to discover why it is that your fortress is so tough (the secret was lost) and work to build more such fortresses in different valleys so that other humans can also be safe. And, if you have time, you’ll also go after the main bad guy. I would have loved to see how the game allowed the player to accomplish all of these goals using only pre-rendered FMV. Lost Eden Redux: Where I solved the startup problems. 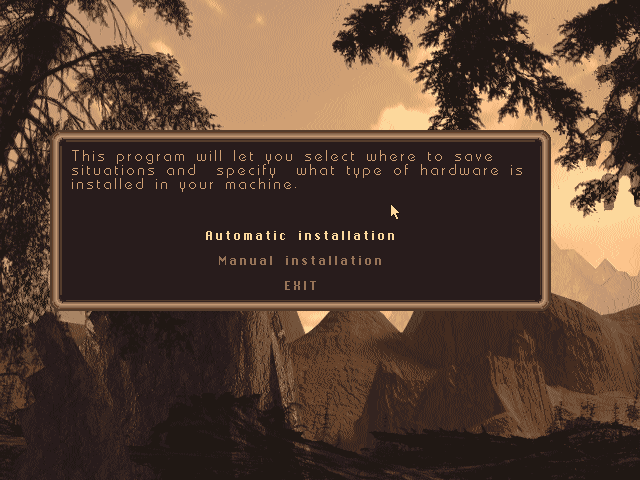 Pretty strange, I had no problems running this game under DosBox. Perhaps there is a problem with in-game soundcard autodetection that cause DosBox to hang. Or, try version 0.64 or lower, this may help.